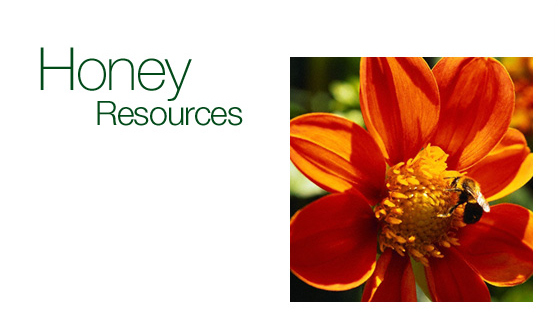 Looking for additional information on honey and the honeybee? Check out the links below to find sites that provide additional resources. Get production, distribution, and sales data for the honey industry, or link to related recipes, cooking advice, and honey facts. Honey recipes for dinners, snacks, and desserts. Brought to you by the National Honey Board. Provided by the National Honey Board, this directory lists suppliers of different types of honey. Browse by state or such varieties as alfalfa, dandelion, and wildflower. Fact sheets, product applications and technical assistance. Provided by the National Honey Board. Acts on behalf of the beekeeping industry on issues affecting the interests and the economic viability of the various sectors of the industry. A source of research-based information and recommendations on all matters of honeybee science and management. Fosters cooperation, dialogue, and professional growth among extension, regulatory, teaching, and research honey bee specialists. Excellent "Frequently Asked Questions About HoneyBees" page. Provides news articles and reference materials for researching bee biology and beekeeping. Check out live bee cameras and a population model. A UK based not-for-profit organization that was established in 1949, with a worldwide membership. IBRA aims to increase awareness of the vital role of bees in the environment as bio-indicators. Discover how bees communicate, and learn the physical and social structure of the hive. View QuickTime movies of bees dancing, read how Nova filmed bees mating in flight. Includes bee games, puzzles, the anatomy of the honeybee, and more! Featuring honey recipes for kids, honey games and trivia. Sponsored by the National Honey Board.